Here's something completely different and super fun (if this is your style!). 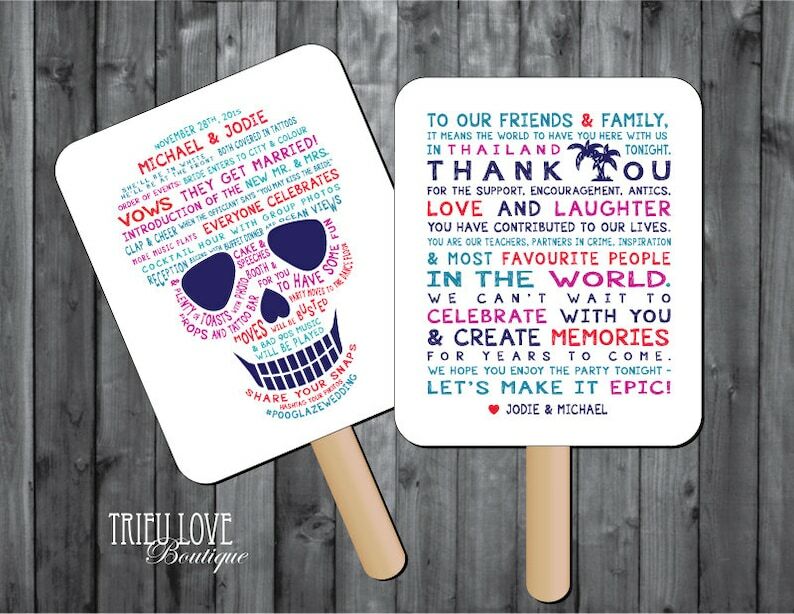 A completely customizable double-sided Skull wedding program fan that will be 5.5" x 6.5" (plus a 3" handle). You can have anything you like written in the skull and on the back! Change any or all of the wording to suit your special day. If you are looking for something crazy and sweet, this is it. Your guests will enjoy reading through this fun Sugar Skull program, and cool down in the hot weather. - Any additional/specific instructions for me. This is a custom job so if you have any requests just ask and I will try to accommodate. **I suggest staying between 12 to 15 lines/pieces of information in total for the shape. More info is do-able but keep in mind it will affect font size. In order to create the big shape, the sizing and spacing of all the text will be customized to fit for you. Let me know what color(s) you'd like to use, basically any color combo can be done for you. I can also color match from any photos you provide. Please note that actual printed colors may vary slightly due to varying monitor screens, this is hard to avoid. 1 PDF file with your final program fan design for printing on letter size card stock. Instructions on how to assemble your wedding fan will be provided on the printout. After payment and your details are received I will deliver a digital file for your proofing within 3-4 business days. You receive up to 2 complimentary edits and I will resend your proof within 24hrs of your edit requests. After you approve the design, I will then send you a final PDF file for printing. If you require a quicker turnaround please message me, it is most often possible but you just have to check with me first. Fans came out beautifully and the seller was great to work with. Revisions were quick and accurate and they came out exactly how I wanted them. The only difference from the pictures is that the corners aren't rounded which makes them look a bit unfinished, but aside from that they're great. Absolutely wonderful to work with. The fans came the first time in a with a color that wasn't quite what we had discussed. The shop was very quick to respond to my concerns and remade them very quickly. They are now perfect!!! Printed items and all digital products, due to the nature of these products being customized to your needs, I cannot make refunds or exchanges. If you are not satisfied for any reason please contact me within three (3) days of receiving your order and I will work to rectify the situation. Please contact me before leaving feedback on Etsy. Thank you. If purchasing a digital file, I will send you an initial proof within 3-4 business days of receiving your payment and required information for the design. You get 2 complimentary revisions. To arrive at the final approved design, it can take as little as 1 day or a few days depending on the speed of your decision on what needs to be changed. I always get back to you with revised proofs within 24 hours for each round of revision (often it is even quicker). If you are purchasing printed product, I will dispatch the completed product within 4-5 business days FROM THE DAY you approved the final digital design. I will dispatch these goods within 2-4 business days of receiving payment. You can Convo me to double check if you can get an order in time, I'll be sure to reply with the best options for you. I try and keep the costs for shipping to a minimum and only charge what is necessary. I'd be happy to honor any significant overcharges in shipping and refund you the difference after dispatching if I learn that it is cheaper than estimated. ** All orders are carefully packaged, please note that we are not responsible for damages that occur during shipping. For shipping outside of Canada, the customer is responsible for any duties + taxes if incurred in their own country. I am unable to advise on what charges will be (if any), nor can I mark a shipment as a 'Gift'. If ordering international please also account for extra days of potential customs delays, which I also cannot advise on. Thank you for understanding. I know it is often difficult to purchase custom design items too far in advanced for an event as we all love to shop around until we are sure we have found the perfect listing. But please don't leave too little time to order as all my product is hand assembled and made-to-order and really deserves the full amount of time it should take to make it perfect. So rushing is never good, plus who really wants to pay a premium for expedited shipping and worry if things will arrive on time? So please plan ahead! You can also message me to double check my turnaround at that time if you really need an order rushed, I try my best to be very accommodating =) Thank you!! We try our best to proofread all the verbiage provided by the customer but it is not our responsibility to know that all words are spelt the way you need, once the final proof has been approved by the customer we are not responsible for any errors discovered afterwards. Any mistakes caught after the product has been printed/shipped will be charged a revision and reprint fee. Each product sold in this shop is copyrighted by Trieu Love Boutique and designer Betty Trieu and all credit for the designs must be attributed appropriately. You may not resell, redistribute or share these designs in whole or in part for any reason, or claim these designs as your own. By purchasing any listing from this shop you accept the terms and conditions.